Planned gifts are typically from one’s assets rather from one’s income. They take the form of charitable bequests, life insurance, trusts, real estate, and securities. Planned gifts can be made directly to the Marshall University Foundation on behalf of the College of Science or plans can be made to defer them to provide support for the future through a will or trust. A bequest can be modified if the circumstances of the donor change. Please contact the Dean of the College of Science for details regarding initiatives for which essential funding is needed or the Marshall University Foundation for answers to specific questions regarded delayed giving. Marshall University and the College of Science are moving from a predominately teaching focus to a more balanced approach to higher learning that requires faculty to establish research programs involving undergraduate and graduate students. This is consistent with the paradigm that excellence in research leads to excellence in teaching. The establishment of effective research programs within the College of Science not only benefits the students but leads to recognition for the University, increased enrollment, and the chance to capitalize on new discoveries that can benefit the economy of West Virginia and the nation. 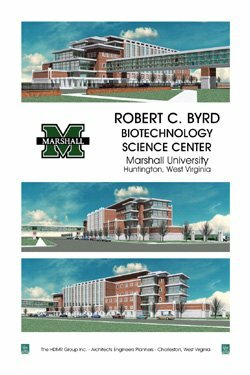 The new Byrd Institute for Biotechnology is a good example of the new face of Marshall University. Science is at the forefront of this transformation. The curriculum has been revised and updated programs and majors allow our students greater career choice within the changing face of Science. The quantity and quality of scientific research is steadily growing and faculty members are engaging undergraduate and graduate students in meaningful research. Graduates are gaining research experience which enhances their credentials for employment, professional school, and advanced degree program applications. But change comes at a cost and at a time when funding for colleges and universities has dwindled, not only in West Virginia but across the country. The College of Science has become increasingly dependent on the generous gifts of our friends, alumni, and other donors to support initiatives in academic excellence, scholarships, awards, fellowships, and developmental support. Without this selfless and thoughtful expression of support by our supporters we would be without means to pursue the endeavors that enhance the educational experience of our students and elevate Science at Marshall University to a higher level of competitiveness. Gifts of any size to the College of Science are welcomed and valued by our faculty and students. Flexible gifts that give a discretionary pool of funds to the College of Science are appreciated as are targeted donations to support scholarships, fellowships, capital projects, endowed chairs, and other initiatives are equally valued. Please feel free to contact the dean of the College of Science directly (Dr. Charles Somerville, address below) for advice on targeted giving. Gifts made within one calendar year can be taken as a deduction from that year’s federal income taxes. Thus, gifts made up to and including the last few days of December are deductible. Donors should be aware of the timeline of giving when dating their check or making online gifts.